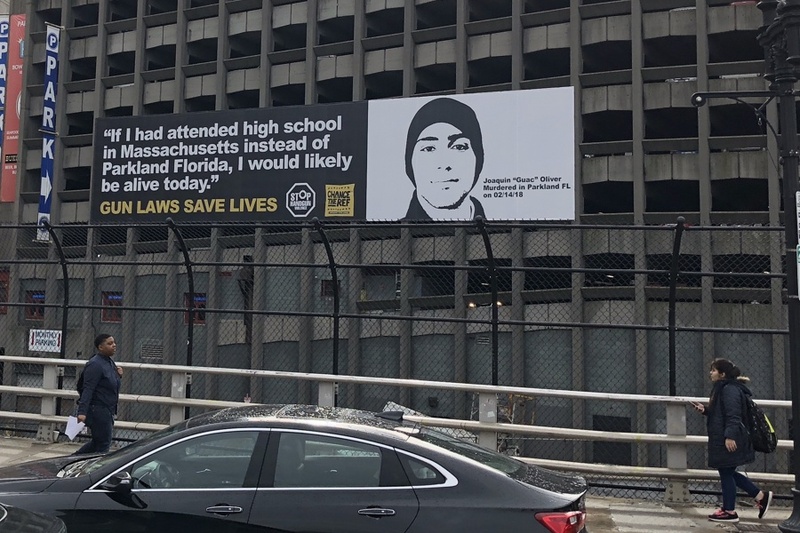 In Massachusetts, a state with some of the nation’s toughest gun laws, a jarring new billboard has popped up over the Mass Pike. It has a challenge for the rest of the nation: Remember Joaquin “Guac” Oliver, and be more like us. Oliver’s father Manuel, an artist, designed the billboard. It’s the latest big public statement from the group Stop Handgun Violence. In what is by no means a coincidence, the billboard emerges in Back Bay with the midterm elections just a week away. Surrounded by a who’s who of Massachusetts Democrats, Oliver showed up for the unveiling in a T-shirt reading “JUST F**CK!NG VOTE,” and says he is filling out a ballot for the first time this year. His state is in the midst of a competitive gubernatorial race, and received a visit from President Trump just last night. He didn’t endorse any candidates, but urged voters to reject anyone backed by the NRA. “It’s too late for us to help our son Joaquin but it’s still early for other parents to save their sons and daughters,” says artist Manuel Oliver. This isn’t the first time Oliver has put his artistic eye to work for the cause. He and his wife Patricia founded a group in their son’s memory called Change the Ref, which aims to push for gun laws via public art. Last week it unveiled a 3D-printed likeness of his son in Times Square, in protest of 3D-printed weapons. He also painted a mural outside an NRA conference in Dallas that depicted Trump as the leader of a circus and NRA spokeswoman Dana Loesch as a clown. Also on hand for the unveiling were some of the high schoolers who led a march this summer from Worcester to the Smith & Wesson firearm factory in Springfield. Oliver joined the teens in their demonstration this year, walking with them while wearing his son’s sneakers. Stop Handgun Violence has sought to draw contrasts between gun-related statistics in Massachusetts to those in other states where laws are more lax, and by its count the state has a firearm fatality rate that’s about a quarter of Florida’s. It’s trying to get the state’s policies enacted across the country, including an assault weapons ban, background checks for private gun sales, and measures like the so-called “red flag” law, which passed in Massachusetts this year. A bill filed by Sen. Ed Markey, who spoke at the unveiling, would provide incentives for states that adopt Massachusetts’ gun laws, called the MASS Act. The bill is doomed, of course, at least for now. With the election inching closer, though, the group hopes the shock-inducing billboard and Oliver’s advocacy will motivate reform-minded voters, help nudge NRA-backed politicians out of office and, eventually, get meaningful laws passed. “Until we take action and … are as passionate on gun violence prevention legislation as the NRA and gun rights groups are on stopping legislation, we reap what we sow and there are deadly consequences,” says Stop Handgun Violence founder John Rosenthal. Rosenthal was also responsible for another iconic highway billboard near Fenway Park, which criticized the nation’s gun laws and featured a digital ticker counting the rising number of dead in real time. After staying up for nearly 20 years, it came down in 2015.